I haven’t posted a Real post in such a long time; it’s hard to start up again. It’s not that I don’t want to post anymore. It’s just that whenever I have something to say, by the time I get to a computer I don’t feel like writing it out. Have you ever had that happen to you? You’re in your car, or somewhere else and then it hits youâ€¦ a great post idea! You think how you would write it, what great information you have and then by the time you get back to your CPU it’s all about Digg and YouTube? Before I started to write this post I was on YouTube for 45 minutes. Bah! It’s gotten to the point where I finally deleted my bookmarks of time wasting sites. It forces me to type out the domain name, which makes it less impulsive at times. Look at youâ€¦ Instead of reading this blog you could be doing real work, making more money. We all have that attitude of we’ll do it later. It’s always later. I have a list of stuff written all over my desktop of things I have to do, each one making me possibly hundreds of dollars maybe even thousands easy. Basically what he says is stop wasting time and start working on building your online business. But in a Black Hat SEO tone. Give it read, and then get some work done! This has got to be one of the funniest videos I’ve seen on YouTube. I can’t get enough of it; I’ve probably seen it 20 times already. EBay Stealth! Newest EBay Suspension Guide! 23 Ways to Get Suspended By EBay! And How to Avoid It! The Feedback Question!! Is it safe to buy feedback? 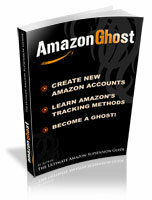 These guides are great and before now were only offered in our eBay Forums Subscribers’ area. But now they’re integrated into a new guide another member and I have put together which basically outlines a Step-by-Step how to create an eBay account for the New Year. As we all know how much eBay changes, this guide has been updated for 03/2008 and we offer lifetime updates. 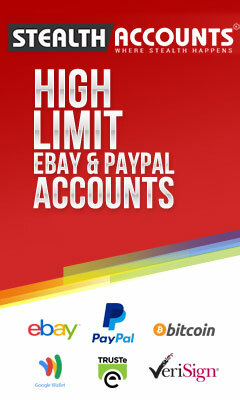 The eBook includes a fully updated guide that supports the new changes to eBay showing you step-by-step how to create a new eBay account, how to not get suspended after creating your new account, how to get around Paypal, learning about better payment processors and how to integrate them with eBay and so much more. I teamed up with a fellow member of our eBay forums and we created this masterpiece eBay Guide, Thirty-Seven pages of raw detailed information you need to get in order to start selling again! If you’re ready and want to learn the secrets the pros use to create a stealth eBay account, go to AuctionStealth and order now. It’s only $27! And if you want to get it free there is an alternative option for you, go to the site now and find out. Scroll to the bottom to learn how to get it free! You can keep struggling on your own or you can learn everything from the pros, we have years of experience and research on the subject, eBay Stealth is the ultimate solution! Create Your very own PHP Redirect! Hi guys! Sorry for not posting in awhile. I’m working on a number of projects that are taking up a lot of my time. Right now it’s like I’m in the eye of a hurricane. And this is my break from the bad weather. While I’m here, I just wanted to post a simple but effective way I use to hide my affiliate links from search engines and make my links look more professional. The first way I hide my affiliate links is through a PHP redirect. <p align=”center”>You are being taken to the correct page. Save that file as yahoo.php or whatever you want to call it and place it into the go or goto folder. Upload the folder to your web host, and call the file in your browser. I created a folder called ‘go’, and in this folder I created the file yahoo.php. You can see it in action bellow. The good thing about a PHP redirects is if you ever needed to change the URL, all you have to do is edit that one PHP file and you’re good to go. Also by using redirects, when someone goes to click on your link the status bar won’t show the affiliate URL, which is good and may help increase affiliate sales. Next time I’ll talk about link cloaking. It’s a little more advance, some cloaking better then others. But a necessary if you want to protect your self from affiliate commission theft. The Girl Scouts Marketing Got To Me! But HoW? So I’m on a Low to No Carb diet for the most part and man… up until 10 minutes ago I’ve been crazy low on energy today. I woke up around 7am, did the usual updating sites, checking the forum and affiliate sales and passed out around noon until 3pm. Luckily! My usual route of checking mail boxes, visiting some neighbors, going to the local stores I found my self being slammed by girl scouts and their cookies. Twice I encountered these little screaming girls and sad to say I gave in the second time. *half of sleeve of my thin mints is down! 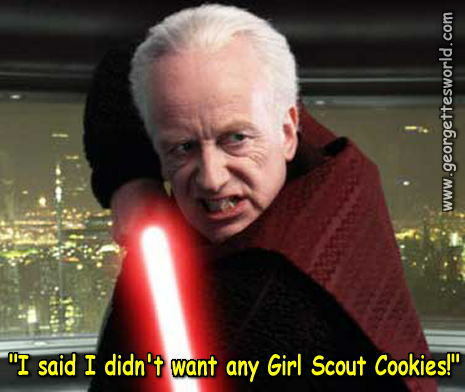 I got to thinking and in my crazy mind of marketing, the first group of girl scouts I wasn’t much interested in, but they got it in my head the idea of cookies. The second group had me sold before I walked up to them. They simply let me walk by without saying anything, but on my way out, I knew they would still be there; wanting me to buy their cookies. I know about their product, I’ve had it before. I had a demand at the time, I was low on energy and needed a quick carb pick me up. And damn the second time was a charm. I bought the cookies. Email Marketing does wonders in gaining confidence in potential customers who just aren’t ready to buy from you. Once you have someone on your list, you can email them again and again until the confidence is built and they’re sold on you. I have auto responders on a few of my sites where when someone signs up, they’re sent an email once a week for about 5 weeks. It really should be more but I haven’t had the time to write more emails yet. Anyway, usually seven emails sales a customer if you can gain their trust. The seventh email is the proven money maker if you do things right. A simple 7 week course on something you’re promoting is enough to gain the customer’s confidence and for you to make that sale. I use GetResponse, it’s cheap at $19.95 per month and is easy to setup and implement. If the Girl Scouts can do it with their sidewalk Super Sales, you can do it too but on autopilot! Try it out!